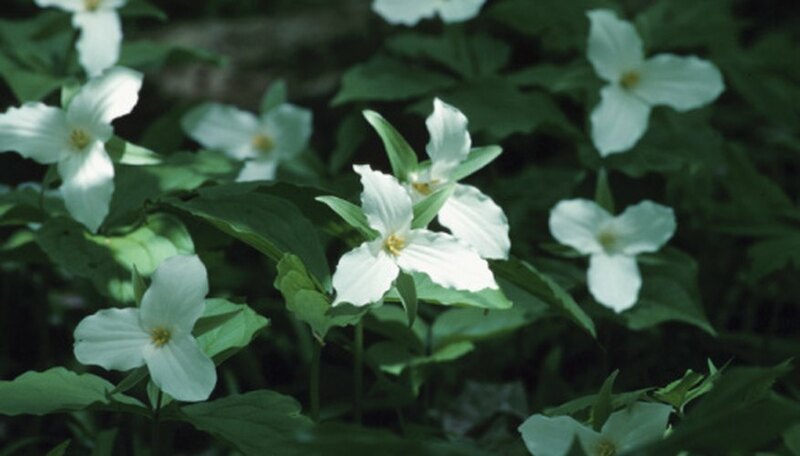 When looking for flowers that will thrive in shade, understand what "full shade" means. Full shade is an area that almost always is shady with little or no direct sunlight. Areas under stairways or covered patios on the north side of your home are typically areas with full shade. Areas under thick trees and groves are considered full shade, but usually referred to as dense shade. Flowers planted in full shade must be able to thrive without any direct sunlight. Hostas (Hosta spp.) have varieties with variegated foliage and fragrant flowers. These perennials can grow in full shade anywhere from 6 inches to 4 feet tall and have lavender or white flowers. They are hardy in USDA zones 3 through 8. Foam flowers (Tiarella cordifolia) have white flowers in the early summer and are hardy in zones 3 through 8. Bleeding heart (Dicentra spp.) 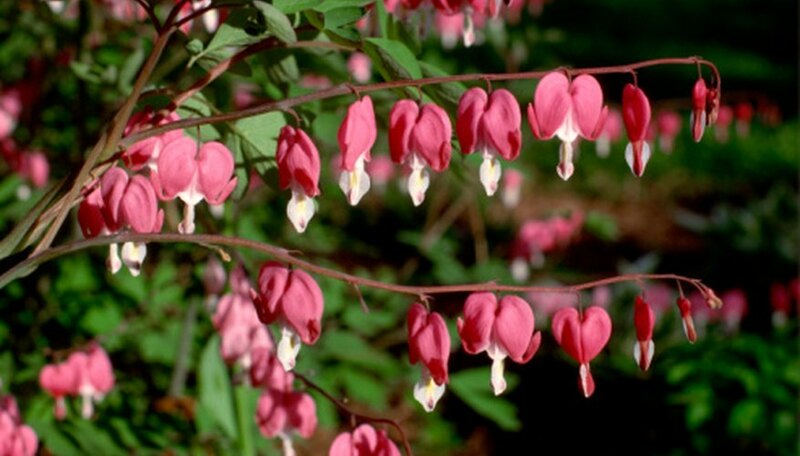 has pink or purpleish-red heart-shaped flowers and grows about 18 inches high. It is hardy in USDA zones 2 through 9. Begonias (Begonia spp.) are among the best annual flowers for full shade. 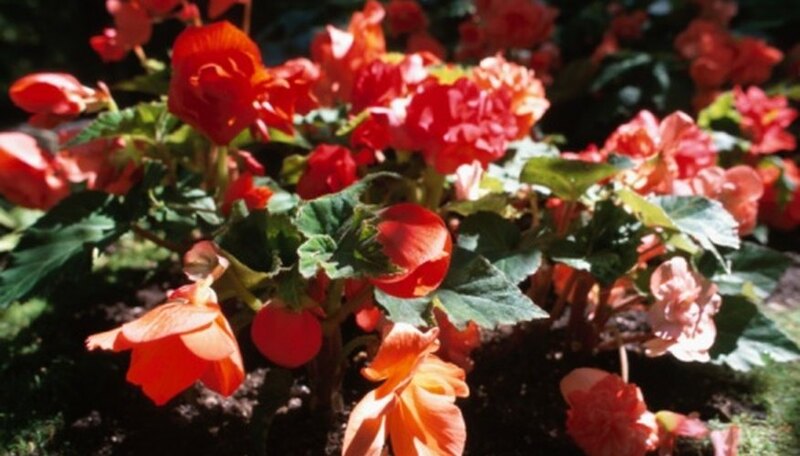 Wax begonia (B. semperfloerns) produces red, pink or white flowers all season and grow about 12 inches high. Tubrose begonia (Begonia tuberhybrida) grows about the same height and has large showy flowers in shades of orange, pink, red, white and yellow. Impatiens (Impatiens wallerana) are among the best plants for color. Flowers bloom in shades of white, pink, red, orange, purple or a variegation of colors. Several flowering vines are suitable for full shade. The trumpet honeysuckle (Lonicera sempervirens) has clusters of yellow-orange, orange and red flowers and blue-green leaves. It can grow up to 20 feet long in USDA zones 4 through 8. Climbing hydrangea vines (Hydrangea anomala) have large clusters of fragrant white flowers and green, heart-shaped leaves. It can grow 60 to 80 feet long in zones 5 through 7. Sweet autumn clematis (Clematis terniflora) also has white flower clusters but only grows about 10 feet long in zones 4 through 8. For shrubs, several variety of hydrangea (Hydrangea spp.) 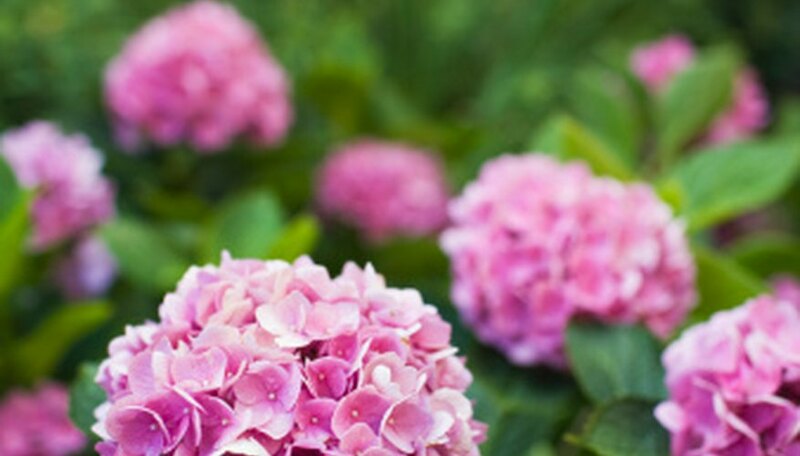 will produce summer flowers including the smooth hydrangea (H. arborescens) and the oakleaf hydrangea (H. quercifolia). Both prefer acidic soil, grow from 3 to 6 feet tall and are hardy in USDA zones 5 through 9. For a larger shrub, the alleghany serviceberry (Amelanchier laevis) and shadblow serviceberry (Amelanchier Canadensis) grow well over 10 feet tall and produce white flowers in the spring. They also prefer acidic soil and are hardy in USDA zones 3 through 7.